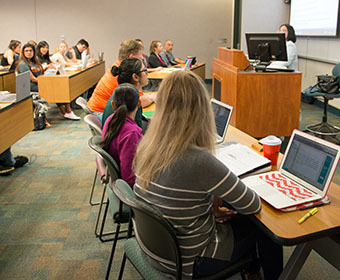 (Aug. 31, 2018) – UTSA Provost and Vice President for Academic Affairs Kimberly Andrews Espy announces the promotion of 34 faculty members. The promotions were approved by the UT System Board of Regents earlier this month and are effective Sept. 1, 2018. Twenty-one faculty members were promoted to associate professor with tenure. Tenure is awarded to faculty who distinguish themselves in the areas of teaching; research, scholarship or creative activities; and service to the university and community; and who further demonstrate strong potential for continued excellence in these areas. Thirteen faculty members were promoted to full professor in recognition of sustained professional accomplishment. Also this year, 13 retired or retiring faculty members have been awarded emeritus status in honor of their years of valued service and contribution to the university mission.